Cutebobble make #1 custom bobbleheads look like you from photos. Custom Bobbleheads are a perfect gift for any occasion because they are charming, fun, and customizable. CuteBobble can create amazing bobbleheads for you that bounce with enthusiasm and are remarkably similar to the person they are modeled after. It’s amazing how much detail and precision they can build into the head and the real customer samples displayed on the site prove how wonderful they are at their craft. The precision and expert craftsmanship is only possible because the Custom bobbleheads at CuteBobble are completely handmade. A team of experts use their artistic abilities, years of experience, and talent to sculpt look-alike heads. 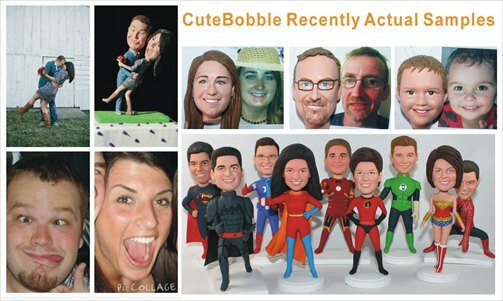 Simply send in a high quality photo and the artistic team at CuteBobble will create a mini-me in no time! The polymer clay allows optimum malleability to free-form near perfect replicas in no time. Personalization also means recognition and CuteBobble is dedicated to creating a product that you’ll love and instantly recognize. Enjoy dedicated customer service with a 100% satisfaction guarantee. You will be able to view free proofs throughout the various stages of the production process and you’ll actually see your bobblehead come to life! If you’re not completely thrilled with the likeness of your personalized, customized bobblehead the artists will revise it to match your vision and the true character of the personified piece. CuteBobble is an expert in their craft and the handmade, custom bobblehead dolls that they ship out are one-of-a-kind masterpieces that will make anyone smile. Make custom bobbleheads for any occasion's gift: Birthday, Wedding, Anniversary, Christmas or even for yourself :-) Send us your photo and get fantastic custom made bobbleheads! We test dozens of university-trained sculptors to find those most able to sculpt realistic heads, and only a select few meet our exacting requirements. Then we train them for several months. Our sculptors make tens of thousands of individual bobbleheads a year, so they have experience as well as talent and training. They know how to make the bobbleheads look just like the pictures you send. We custom made real bobbleheads dolls without any hidden cost. Some online seller tempt you to spend much more money by providing such options as: i want my head to bobble /choose base color/ master made...what a cheating!-- At Wowbobble, you will find, all of these are free originally! The bobblehead dolls at bobbleheads website of course should be bobble! You can also tell us any base color / shape you want, we can make it for you without 1 cent extra. 12 Hours* 7 Days Online live Support / Email Support. You can choose preferred shipping meshods when order online, for example: ships within 2-3 weeks / 15 days / 10 days / 5 days rush order. We will complete and send out your package within the timeline as promised. By DHL / UPS, all our package can be delivered to USA, Australia, Canada, UK and other area and cities within 2-4 days! CuteBobble.com made more than 20000+ custom bobblehead dolls since 2007. Over 97% of our customers would recommend us to a friend, which is quite a testimonial! You can check the reviews for more details. We know the best way to keep our business healthy and growing is to give you an excellent product and top-level service. Most bobbleheads providers use poly resin clay and then they bake and mold the dolls - apply paint and the doll is yours... We only uses fine Polymer Clay - the color is the clay so the final product is actually brighter, true 3D likeness and higher quality. personalized bobbleheads meet with any quality problems or accidental damage,you can sent back to us and get free restoration service within 12 months, but you should responsible for the round delivery fee!